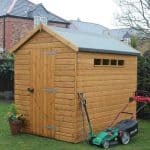 The Hartwood 7′ x 7′ FSC Pressure Treated Double Door Overlap Apex Shed with its pressure treated timber and smart design, is a shed that will make your garden that little bit better by just being inside it. 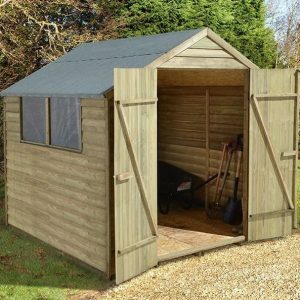 This is a good mid sized shed that offers you a generous amount of storage space and with those large double doors will make storing items and getting them out again no trouble at all. So that the shed is filled with natural light, two shatterproof and child friendly windows are on one side of the shed. 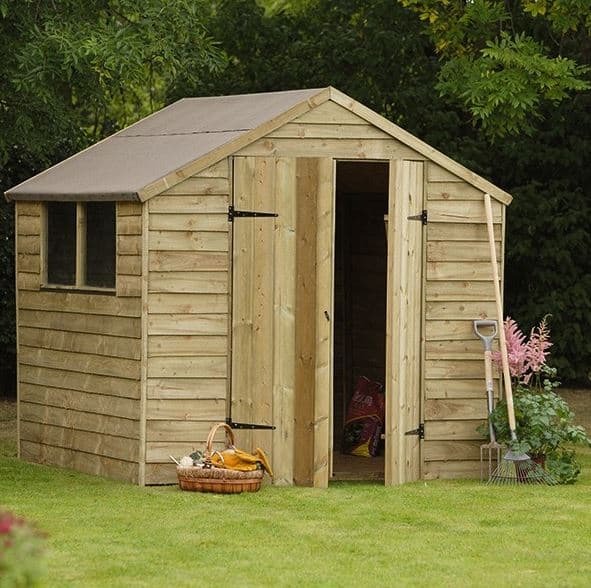 This really is one fantastic looking shed that is going to be something you really do love to have as part of your garden. 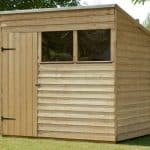 It is not just the pressure treated wood that makes this such a great shed, it is fact that it is also so very well made with features like the 8 mm thick overlap cladding with the strong frame behind it being one of the main impressive features of this shed. The doors are just incredibly strong as they are both made with pressure treated wood, held in place with hinges and even have a ‘z’ brace on the back. 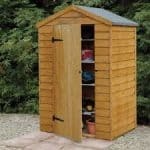 This really is one very strong and long lasting shed that will serve your garden well for many, many years. Very few sheds manage to pull off the rustic look that the Hartwood 7′ x 7′ FSC Pressure Treated Double Door Overlap Apex Shed effortlessly does. This has a truly fantastic classic and rather unique kind of look when compared to what other sheds are doing these days. It is also offering you a decent amount of storage space so if you do have a lot of tools, gardening items or just a ton of kids toys that you have to jump, dive and cartwheel to avoid on the garden lawn. Then this shed will give you the storage space you need to take care of all of this. 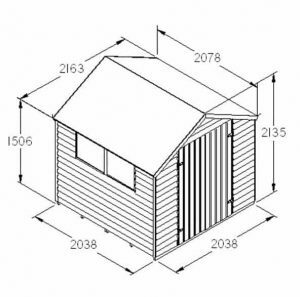 While this is called a 7 X 7 shed, the actual size of the shed is 7 feet 1 inch for the width and 6 feet 10 inches for the depth, so as you can see while not a huge shed it is certainly not what you would call a compact one either. The height along the ridge really did impress us as it is 7 feet. The eaves height is 4 feet 11 which we know may sound a little low, but it is right around what we would expect give or take an inch or two. Keeping your belongings safe from an aerial assault from the rain and snow is a fantastic looking apex roof that is made with strong oriented strand board and then covered with this very robust sand felt that is not going to rip in the wind. We really like this roof and love how due to its design it is going to stop rain from sitting on top, trying to sneak its way inside. The reason that the shed has the rustic charm that it does is because of the cladding. They have used this awesome looking overlap cladding that is also strong as it is 8 mm thick. The way that this cladding is made and attached to the frame, leaves no areas for water or wind to get into the shed. The frame really does its job very well and this shed is going to stay a robust structure for many years. As the cladding is so well fixed to it, you could give this a good bash with your hand and the only thing that will move is you when you jump because you have a sore hand. They really have made sure this is a shed that is going to last and a big part of this is the frame. Oriented strand board is what is going to be under your feet. This, along with those well made floor joists, enable the shed to be able to take a lot of weight. This means that if you do have heavy items you want to keep out of the rain that this shed would be perfect for that. Also the strength of the floor means that when you are walking around in the shed, you do not feel that you have to tiptoe around. We are not saying you should start break dancing in here, but we are sure the floor could handle it if you actually did. As the wood goes through a pressure treatment process this means that annual treatment is not required. Perhaps a few years down the line you may want to give it a coating just to be safe, but not having to treat this once you have installed it really is a huge positive of this shed. 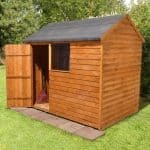 As the wood has been pressure treated you are given a very generous 15 year anti rot guarantee with the shed. This though is dependent on you actually looking after the shed properly and not abusing it. As well as its epic good looks, another one of the standout features that will catch your eyes are those large double doors that are going to make getting your mower back in, tools out and yourself in and out very easy. With both doors open the amount of open space staring at you is just incredible. These doors by the way are made with just as much care and attention to detail as the rest of the shed is. Each door is supported with two strong hinges and there is a ‘z’ brace on both doors to make sure they are strong for the lifetime of the shed. One side of the shed has two fixed windows that are made with 1.2 mm thick anti shatter styrene. These windows are going to make it so plenty of light can get into the shed, but they do not open which is a little bit disappointing. We do also feel that a window on each side may have worked a little better, but we will admit that this is a very minor and nit picking criticism. The double doors will not be flapping around in the wind, making a load of noise and keeping your neighbours up. This is because they can be securely closed with a pad bolt. This is a very high quality pad bolt and while we do wish that they included a lock it does what it does very well. We know that we did say we wished that there was a window on both sides, but actually when we think about it, from a privacy point of view the fact that both windows are on the same side does mean that you can position the shed so that the windows are not facing an open area of your garden. This shed has just such a great look that we feel any tinkering or messing with the design would be a crime that should have some involvement from MI5. But if you did want to give the shed a little bit of a personality change then you could always paint it a different colour. This is a shed that deserves to have some awesome stuff inside it, but if you do then you will want to make sure the shed is locked up during the night. Well they do actually offer a, Yale Hasp Steel Black Finish 120 mm & Brass 40 mm Padlock that not only will keep your shed locked up, it also has a very smart design. For £149.99 they have a plastic shed base, but to be honest with you, we think this is priced a little high. We love to see pressure treated timber used for a shed as we know right off the bat that it sets the groundwork for a high quality shed. And high quality is certainly what this shed is. That wood is going to stay rot free for many years and require, very little TLC from you. In general the whole shed is so very well made that we can see you get well over 20 years of use out of this shed. 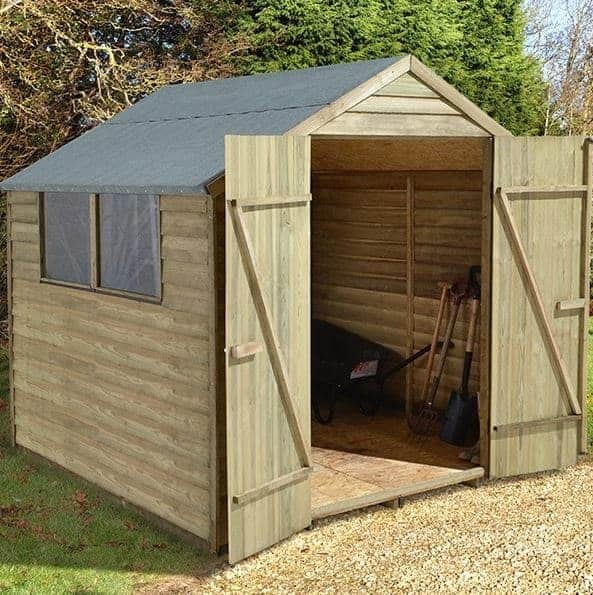 This is a mid sized shed so keep that in mind, but it is one of the larger mid sized sheds out there so you will have a decent amount of space to use. Be sure to have a friend or family member to help you do this and you will have no trouble at all. There may be a couple of awkward sections, but nothing that is going to put you too far over the edge. 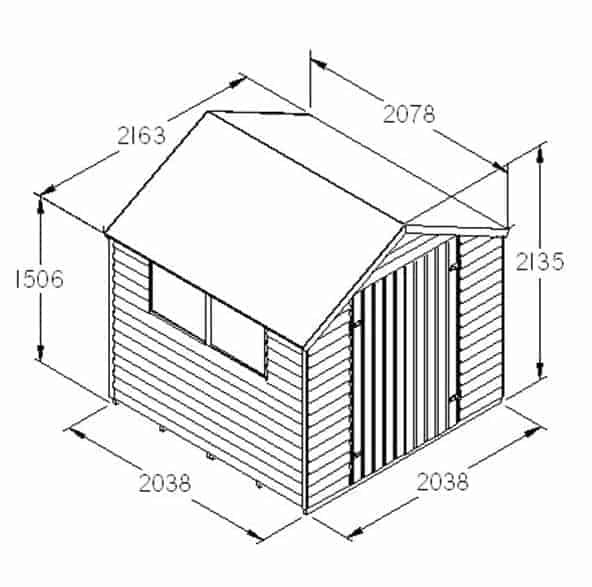 They do say that 4-6 hours is the build time for a shed like this and we would agree with that. 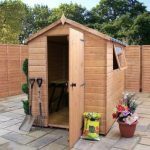 We really love this shed and we know that for a mid sized shed the price may seem a little high, but when you take into account the very high quality and the pressure treated wood it is actually a fair price and we feel that you will be very happy with your purchase. Final Thoughts: We love the classic shed design that the, Hartwood 7' x 7' FSC Pressure Treated Double Door Overlap Apex Shed has. They really have designed this so that it captures your attention and we really love that about it. 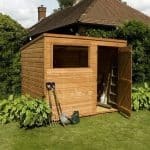 The overlap cladding really does give it a rustic charm and as all of the wood has been pressure treated, you know that it is a shed that is just as strong as it is pretty. Those double doors make getting in and out just so much easier and actually even though this is not a large shed the storage space it offers is not too shabby at all.